The Beaufort Eagle performs a fly-by of Surfside Point on Christmas Day,2014. On a beautiful warm Christmas Day, I met several long-time residents, their children and their grandchildren on Surfside beach as they took in the outdoor scenery before the big feast. Hard to believe that we are all now long-time residents of some two to three decades, and that we carry the legends surrounding Beaufort Grove, Roberts Bay, going well back into the last century. We have all lived, or been born and grown up beneath the Beaufort Eagles eyrie, situated in the O.J. William’s Fir at the base of Summerset Place. I was pleased also to find Philip Baardman On Surfside Point with his deluxe camera and 400m lens. As we stood there, discussing the cooking time for a forty pound turkey, one of the Beaufort Eagles flew by, moving powerfully toward the downtown waterfront. Too far and too fast, I thought, for a decent photo, but Philip shot off a rapid sequence anyway. Remarkably, Philip managed to capture the moment. The Beaufort Eagles have returned every year since then and are one of the most photographed and visited attractions in Sidney. In fact, they are highly visible from newly-elect Mayor Steve Price’s front window. The fly-by over – past the Spooners grandson, year-old young Ethan, past Nathaniel, now a biology student at UVic, and Rebecca, nearing graduation in Parklands – was a heartening reminder that we are all stewards, with responsibility to carry on the legends and the legacy of this unique area. We have much to celebrate with the end of the Salish season of Siset, the elders moon, going into this new year, and the last moon of Ninene, meaning our “offspring” or “young ones”. 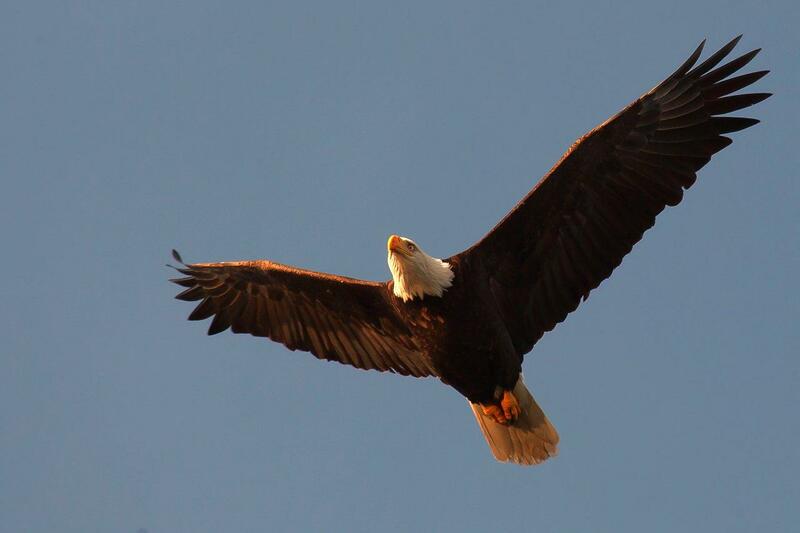 This entry was posted in Uncategorized and tagged Beaufort Eagles by elaineethier07. Bookmark the permalink.